In 1973, when Sathyan Anthikad finished Class 10, he wanted to join the Film and Television Institute of India at Pune. But he was told that he could apply only after graduation. “That meant I had to wait five years,” he says. 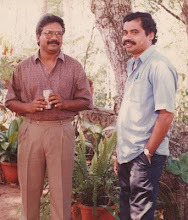 At that time he came across an interview with director Dr P Balakrishnan in the film weekly ‘Cinemarama.’ “I read that he had introduced several people to Malayalam films including musician A T Ummer and director I V Sasi.” So Sathyan wrote a letter to the Chennai-based director. He was surprised to receive a hand-written reply within a week asking the youngster to come for an interview at a hotel in Kochi. After the meeting, Sathyan was hired as assistant director for Balakrishnan’s next film, ‘College Girl.’ “Later he told me my letter was very striking,” says Sathyan. “I do remember writing, ‘Cinema is not a craze for me. It is a dream. I request you to give me an opportunity if possible.’ Usually people write letters begging for an opportunity but I did not.” Once he got an entry into films Sathyan impressed everybody with his sincerity and dedication . “ Dr Balakrishnan was very happy with me.” At that time Sathyan used to write poems. One of them was published in ‘Chandrika,’ a weekly from Kozhikode. A copy was sent to the studio and Balakrishnan happened to read it. “He called me and said that it was a nice poem.” Balakrishnan asked Sathyan to write a song for his next film but Sathyan said that he had never written one. “A man who can write a poem can also write a song,” said Balakrishnan. Sathyan wrote two songs for ‘Love Letter.’ When he wrote the lyrics of Oru nimisham tharoo ninnilaliyan in ‘Sindhooram,’ it became a super hit. 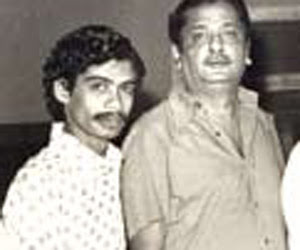 Sung by Yesudas, the inspiration behind the love song was “my feelings for a girl , Nirmala, who eventually became my wife.” He went on to write the lyrics for more than a hundred films even as his job as assistant director continued unabated. By this time he was getting offers from producers to become a director. In 1981 he accepted an offer from producer K Majeendran to direct a film. He sat with scriptwriter, John Paul, and wrote a script based on kathakali. “We did a small schedule with Nedumudi Venu,” he says. Sathyan then had to stop because Kamal Haasan, who was the hero, was acting in another film for which he had to have a moustache. “Since a kathakali student was not supposed to have a moustache, I decided to wait till Haasan finished shooting.” During that enforced break, an unforgettable incident took place. One morning, a man knocked on Majeendran’s door at his house in Kochi. When the producer opened it, he was shot dead. “Apparently it was business enmity. But my film collapsed after that.” It took more than a year before he attempted another film. P H Rasheed, an acquaintance of Balakrishnan, offered to produce a film. It was a comedy called ‘Kurukkante Kalyanam’ which became a hit. “This was a turning point for me as I went on to be accepted by the public.” Thereafter Sathyan made several films, all of which did well at the box office. In 1986, Sathyan’s next turning point came when he met actor Sreenivasan and gave him the idea of ‘T P Balagopalan MA.’ “I had a concept of a middle-class man who earns Rs 700 a month who meets a girl in the same situation,” he says. Sreenivasan, who liked the idea, wrote the script and the film became a hit. “When Sreenivasan and I were working on the film we realised we had many things in common,” says Sathyan. “We both come from middle-class families and had a similar outlook and sense of humour.” After ‘Balagopalan,’ the duo worked on ‘Gandhi Nagar 2nd Street’ which became a bumper hit. Together they worked for several films and all of them did well at the box office. By this time Sreenivasan’s career as an actor picked up and he was unable to find time to write scripts. Other scriptwriters such as Lohitadas and Renjan Pramod, who wrote ‘Manasinakkare’ and ‘Achuvinte Amma’ for Sathyan, had become directors and were busy with their own films. Sathyan realised that if he wanted to continue to make films he had to start writing himself. “So I took the plunge and wrote the script for ‘Rasathantram’,” he says. The success of the film inspired him to write the scripts of ‘Vinodayatra’ and ‘Innathe Chinte Vishayam.’ His next film, the 47th, ‘Bhagyadevatha’, starring Jayaram releases on April 23.